WANT TO KNOW MORE ABOUT THE SCHOLARSHIPS WE OFFER? Please download the application and follow all instructions. Failure to complete the application in its entirety will automatically disqualify the applicant. Please send any questions regarding applications to ofeapp@gmail.com. 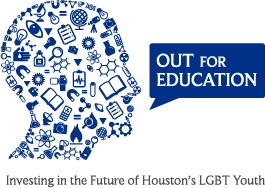 Out for Education was founded by PFLAG-Houston and Hatch Youth. While we’ve been a separate organization since 1999, we’ve retained strong ties with both organizations. PFLAG-Houston still provides funding for a scholarship. Many students from Hatch Youth, which is now part of the Montrose Center, are recipients of our scholarships. Like PFLAG and Hatch Youth, we are dedicated to improving the lives of young LGBT individuals.